The word interview makes us uncomfortable the second we qualify in the category of the interviewee. An interviewee is a person who is interviewed by the authority to qualify for a certain task or position. Well, you must have experienced an interview once in your school life. An in person interview refers to the face-to-face meeting of the interviewee with the interviewer. This is a traditional mode of interview, which companies are following since before the emergence of technology. However, it is not limited to job vacancy and school admission. This method of interviewing is also used in conducting surveys. Are you an interviewer or an interviewee? No matter what position you hold, nervousness and fumbles never leave you alone. Do not worry. Let us have a look at some tips for interviewers and interviewees. Tips always make thing easier, whether you are an interviewer or an interviewee. Was doing homework in your school days always a headache to you? Well, then this may sound as a sad news for you. Homework may not leave you even after you are done with the school life. Sadly, or may be not sadly, you will have to do a little homework before you begin the interviewing session. From the available source (resume) gain background knowledge of the prospective candidate and enable yourself with an upper hand (Although you already have an upper hand by being an interviewer). Does the word ‘pre-prepare’ exist? Of course, it does not exist. Let us say pre-prepare your questions. As an interviewee, no one knows what questions might be asked however, as an interviewer you do have the background knowledge of the position offered. Thus, prepare the questions that might help in highlighting the strength and weaknesses of the interviewees. By preparing beforehand, you may be able to take the correct decision for recruiting the deserving candidate. Well, we have discussed the pre-interviewing process. Let us have a look at during-the-interview process. The duty of an interviewer is to provide comfort to the interviewee in order to understand the real person. Let us make it simpler with an example. When you look at the interviewee in a very intimidating manner, he or she is bound to be nervous and stress. Rather if you start in a friendlier way, they might be able to open to you. Moreover, a sound/noise proof cabin and friendly atmosphere may bring out the real self of the interviewee, which may help you while making the decision. Thus, make everything sound interesting. This will not only show your passion regarding your job but also make the interviewee comfortable. An interviewer has the responsibility to enroll and recruit deserving candidates for the job in the organization. Thus, it is important for the interviewer to conduct an efficient interview that effectively gives the desired output. Well, interviewers are not the only ones nervous. Unlike the recruiters, the candidates have a goal that they wish to accomplish by stepping up. Let us have a peek at the tips for the job seekers to make a long lasting impression. No matter if the words ’employment, interview, job’ start with different alphabets, the alphabet ‘H’ always tag along. H says homework; moreover, homework is the key to better performance. Do your homework well. With the advancement of the technology, most of the information is always available online. Make sure to understand the visions, achievements, etc of the company. Did I just say ‘sell’? Yes, I did say sell. What do you do in a market? You chose the best offer available. Similarly, in an interview, the interviewer is the buyer and you are the offer. If you satisfactorily sell yourself, better from others, then nothing can stop you from ensuring the position. Nevertheless, how would you sell yourself? Highlight your strengths and capabilities cleverly. If the interviewer is impressed, nothing can stop you from achieving your goal. The first thing that we learn at school and personality development classes is introducing oneself. Your journey of making an impression on the recruiter starts with the perfect introduction. The first impression should grab the attention of the interviewer. Do not let your confidence falter even when the interviewer interrupts you. You have barely 8 seconds to do your work as the average attention span of human is 8 seconds. Those 8 seconds may give you full score if you use it well. Moreover, do not waste yours and theirs time by making an irrelevant conversation. For a human, it is impossible to become the epitome of perfection. Sadly, we always try to ignore the bitter truth. However, weakness always accompanies strength. Thus, during an interview do not hesitate to speak about the weakness. Though keep in mind that you should not elaborate about the weakness, instead elaborate on how you learnt from the mistakes and shortcomings. This will reflect the maturity in your personality. How you look might not matter to the people that love you, however, it will definitely matter to your interviewer. Here, by your look I mean is the dress code. A party wear gown may look beautiful but cannot replace the corporate look. Wear professional attire that reflects your professional attitude. Moreover, control your body language. Your body language and reaction describe you and your professionalism in the interview chamber. Thus, it is necessary to reflect genuine confidence to your interviewer. Remember, if you are good at what you do then nothing can keep you from attaining success. If you do your homework well, you will definitely make an impression on the interviewer. Thus, be confident, genuine, smart, intelligent, punctual, well learnt and well dressed. 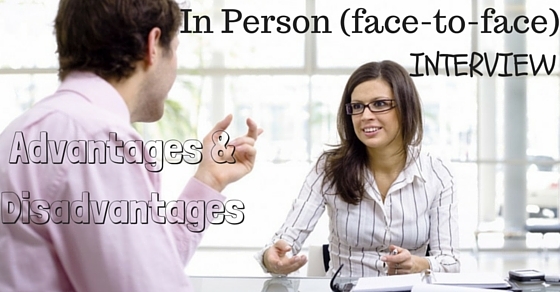 Now, let’s look at some advantages and disadvantages of face to face communication. In person interview is the oldest method of interviewing. It is still widely used in recruiting process. Well, in this fast changing world, it is a tough job to keep up with the change, however; the in person interview has still maintained its position in the corporate world. How did it maintain its position? It is the advantages that the in person interview offer, because of which it still exists. Communication skills are the most important thing when it comes to recruiting. The first skill in any job description is the communication skill. It is important within not only the peer and colleagues but with the higher authorities. The in person interviews enables the interviewer to understand the skills of the candidate. Moreover, it also helps in identifying the personality of the person via the body language. This also helps the interviewee at one point. The interviewee can communicate well when he or she can see the reaction and body language of the interviewer. Thus, we can conclude that in person interview benefits both the parties via the communication and body language, which is not possible in telephone or video interviews. ‘Blue colour is so beautiful. Sandwich is delicious.’ Are the two sentences related? They are not related. Similarly, in telephone and video interviews, it becomes a bit difficult to continue on the same topic and convey the thoughts clearly. For example, if the interviewer asks you about your previous experience, his motive is to look out on how you would involve that experience in the future projects. In person interviews makes it possible for the interviewee to answer accordingly. Moreover, face-to-face communication prevents interruptions. Not everything can be open to all. There are certain aspects of our lives that we would not want anyone else to know. Well, the face-to-face interview maintains the confidentiality. For example, personal issues related to family or a previous crime. No one would like to announce the world about an ex-crime. Once done is done, nothing can reverse the past. However, people prefer it to be a secret. Thus, in person interview enables the person to share the important piece of information personally and secretly. Moreover, this type of interview prevents anyone to copy your thoughts or ideas, unlike the group interviews. It is an interviewer’s responsibility to recruit a deserving and ‘better from the bunch‘. However in the group interviews, the recruiters are unable to focus on one person, as the entire group is active at the same time. Moreover, group interviews prevent the shy candidates from showing their talent. As a result, many deserving candidates may lose the opportunity of the job. However, in person interviews allows the interviewer to understand the entire group of prospective candidates on a personal level and therefore coming to a perfect decision. Well, the advantages may exceed the ones that I have mentioned here. However, the advantages surely do accompany the negative points. Thus, along with the advantages, it is important to learn about the disadvantages of in person (face-to-face) interviews. Disadvantages may vary person to person, however; you cannot entirely neglect the possibility of the negative impact altogether. Not everyone can feel comfortable in the new environment. Regardless of the occasion, it is impossible for some people to disguise their nervousness under the cloak of confidence. ty. In person interview, limit the opportunity for shy people to display their talent, which they could have easily shown via a task or in the written form. Thus, Face-to-face interview is not efficient enough to judge the people who suffer anxiety. A group interview, unlike the telephone and the in person interview, it takes lesser time to conduct. Moreover, it becomes easier to eliminate the non-deserving candidates. Compared to other modes, in a face-to-face interview, the interviewer needs approximately 30-45 minutes to judge the interviewee’s skills. Thus, if more than ten candidates apply for the same post, it becomes a time consuming process for the recruiting staff. Who would like to spend money on something that does not provide anything in return? Of course, no one would prefer unprofitable investment. Similarly, interviewees of the locality may easily reach the place but the applicants who live in another city may have to spend to travel. However, no one can guarantee the job. This may prove to be an unprofitable investment. However, if the company provides the expenditure then it is an unprofitable deal for the organization on a whole. What do you mean by subjectivity in the decision-making process? Well, perception differs from person to person depending on the maturity and experience gained in the life so far. Similarly, in face-to-face interview, the selections of the candidate differ according to the perception of the interviewer. Even when you think that you are giving your best, it may not impress the interviewee. In certain cases, the subjectivity may differ on the basis of astronomy, philosophy, sociology, psychology, etc. For example, people who are obsessed with zodiac signs may conclude that a Scorpio is not applicable as they are secretive. So, no matter what mode of an interview is selected, the subjectivity of the organization matters. Thus, it is advisable for the large-scale company’s benefit that they should implement more than one technique in the recruiting process to ensure correct decision.